This is a video of 4' x 8' CNC router with 4th rotary axis for wood carving, the 4th axis rotary with diameter 2mm and length 2500mm. It can be used to do legs of chairs, tables, beds, The flat table is 4 feet by 8 feet, very suitable for nomal MDF board with 1220*2440mm size, the rotary can do wood column hollowing by straight bits. 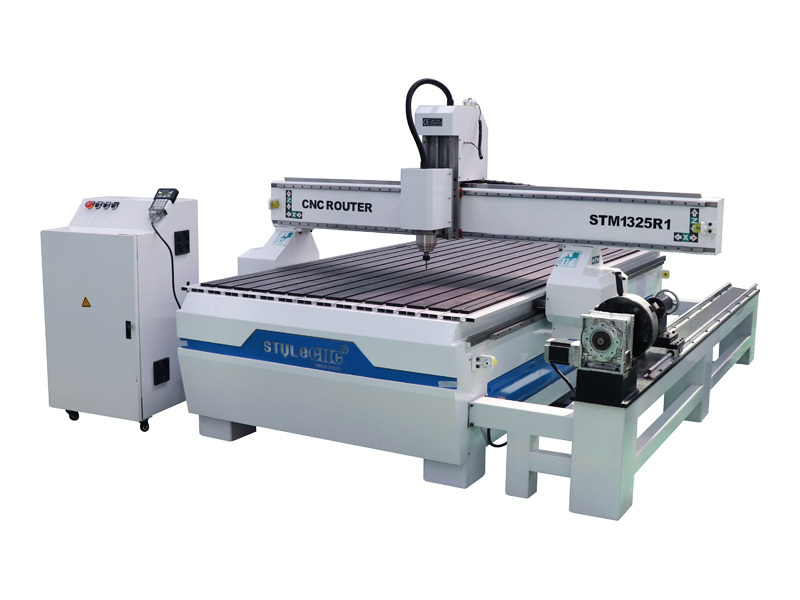 The 4' x 8' CNC router model is STM1325R1. 1. Advertisingin dustry: signs, trade mark, name plates, badge, decorative gift, embossed medal, certificate, souvenir, photo frame, furniture decoration. 2. Small-scale woodworking industry: solid wood furniture, mahogany furniture, MDF paint door, solid wood door, composite door, cupboard door and window, bed side cabinet, folding screen etc. 3. Art work industry: wood crafts, mural art of wood, artwork, embossed, jewelery, cosmetics package, musical instrument. 4. Soft metal processing: aluminum front panel, popcan, aluminum honey comb panel, train car and air craft interior decoration, bronze medal, copper mold. 5. Electronics industry: electronic component, integrated circuit, electronic plastic case, electronic product model, circuit board, electronic Light box, computer and mobile phone key board, engraving avariety of electronic products. License: The text of "4' x 8' CNC router with 4th rotary axis for wood carving" by STYLECNC is licensed under a Creative Commons Attribution 4.0 International License.